The genus name Phytolacca derives from the Greek phyton, "plant," and the Latin lacca, "crimson lake," in reference to the plant's ability to yield a reddish dye. 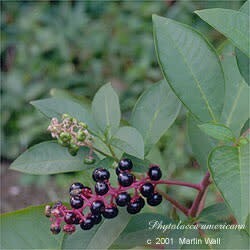 The common name poke is thought to derive from the Algonquian poughkone, a name for any plant that yields a red dye. Poke, native to North America, thrives in most soils with plenty of moisture and full sun to partial shade. It is a large, smooth, branching herb with greenish, reddish, or purplish stems. The leaves are alternate. The hermaphroditic white flowers bloom on a long stem. Dark purple berries appear after the flowering; each berry is composed of five to twelve segments. Poke has a long history of being used to bolster weak immune systems. At one time it was used to treat syphilis, and in Africa today it is being investigated for its ability to control bilharzia, a parasite-caused disease contracted by bathing in water containing certain snails. It is used in the treatment of AIDS, arthritis, cancer, herpes, leukemia, liver cancer, lymphatic infection, mumps, rheumatism, swollen glands, tonsillitis, and tumors. Topically, poke can be prepared as a poultice to treat boils, cancer of the skin or breasts, and fungal infections; as a compress to treat mastitis; as a salve or wash to treat bedsores, cancers, carbuncles, chicken pox, eczema, fungal infection, hemorrhoids, herpes, measles, psoriasis, shingles, sprains, swelling, and tonsillitis. All parts of poke are toxic, but some parts can be eaten after proper preparation. The root is not generally considered edible. However, the young shoots (less than 1 foot tall) can be peeled and eaten, as can the young leaves (from stalks less than 1 foot tall); both the shoots and the leaves should first be boiled in two changes of salted water (ten minutes for the first, five minutes for the next) to leach out any toxic components. The berries can be eaten when cooked but are toxic when raw. Do not eat red-tinged portions of the plant, the mature leaves, the raw berries, or any other part of the plant. The berries produce a red dye that can be used as an ink and to color paint. In fact, the United States Constitution was written in pokeberry ink. Use poke only under the supervision of a qualified health-care professional. Avoid during pregnancy. All parts of the plant are toxic and may cause digestive distress, vomiting, lowered blood pressure, and depressed respiration. Overdoses can be fatal. Doses for this plant are much smaller than for other herbs. If preparing poke as a tea, one mouthful taken several times daily is sufficient; as a tincture, two to five drops twice daily is fine. Consume plenty of water when using poke as medicine. Handle the root with gloves, as the sap can cause contact dermatitis. Dust of the dried plant may cause sneezing and eye irritation.